Want a simple and delicious side dish to serve with your dinner? This recipe from How Sweet It Is fits the bill! To go along with our chicken parmesan burgers last week, I thought that pasta was a fitting side dish. Instead of the traditional spaghetti or other shapes with marinara sauce, I turned to this cheesy recipe. Definitely a keeper in my book! Boil the water and cook the pasta according to package directions. 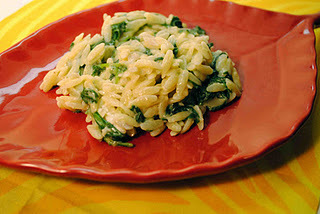 While the orzo is cooking, heat a skillet on medium heat and add the olive oil. Add the onions with a pinch of salt and sauté until they become soft, about 5 minutes. Add the garlic and spinach, cooking until the spinach wilts. In a bowl, combine the drained pasta, spinach mixture, and the cheese, stirring until the cheese begins to melt. Add the nutmeg and season with salt and pepper, if desired.